Sete Lagoas - a city built amongst seven lakes. Uberlândia - a very modern cosmopolitan city, the second largest city in the state. Minas Gerais was the seedbed of the Brazilian revolution. Inspired by the American and French revolutions, a group of Mineiros, led by Joaquim José da Silva Xavier, nicknamed Tiradentes because he was a dentist, tried to break free from Portuguese rule, but was suppressed. The motto of Minas is Libertas quae sera tamen (Liberty, though it be delayed). "Minas Gerais" means "General Mines", so called because of the various mines in the area. Some still operate; in February 2006 a ring of diamond smugglers, passing off diamonds from Minas as if they were South African, was broken up. Electricity in Minas Gerais is 110 V 60 Hz, but there may be 220 V outlets, so ask. Plugs have two round prongs about 2 cm apart, but outlets that also handle US plugs are common in places frequented by tourists, such as hotels and LAN houses. uai - used liberally as a form of emphasis, often at the end of sentences. It sounds like the English word why, but is basically meaningless and can be ignored. It is also equivalent to ué (less mineiro) and can be replaced for ora (more formal). trem - locals use the word for train to mean thing or stuff, as in "Me passa aquele trem ali" ("Pass me that thing over there"). Major airports serving the state are located in Belo Horizonte, Juiz de Fora and Uberlândia. Trail of Tiradentes - The cobblestone streets of quaint mountain towns such as Congonhas, Ouro Branco, Ouro Preto, Mariana, São João del Rei and Tiradentes hold a great deal of colonial history, largely untouched by time. 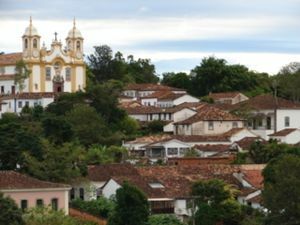 Grand churches, government buildings, and noble residences abound, their histories entwined with the local gold rush, slavery, and the Inconfidência Mineira, an important early attempt to break free from colonial rule. Many area churches bear the mark of famous architects and artists such as Aleijadinho. Minas' traditional cuisine is unique but was mainly influenced by the Portuguese. Minas prides itself on its food, and comida mineira restaurants can be found throughout the country. Angu - A hearty side-dish similar to polenta, with sausage and collard greens, and sometimes other meats or vegetables. Bolinho de mandioca - Fritters made of mandioca, potato, and egg. Feijão tropeiro - One of the most typical dishes, consisting of brown beans cooked with pork rinds, eggs, garlic, onion, mandioca flours, and other ingredients. Frango com quiabo - Chicken and okra, heavily tempered with garlic, onion, and tomato. Served over rice. Queijo mineiro - A white table cheese, popular throughout the country. Quibebe - Mashed squash with onions and seasoning. Minas is home to various producers of (the finest, as some might say) cachaça, a very strong drink, often found on recipes for caipirinha cocktails. It's capital, Belo Horizonte, is said to be the "alcoholics' paradise", with more than ten thousand bars and restaurants. Most big cities have cronic safety problems, which may or may not affect visitors. Number one tip: Dress simply, without flaunting expensive clothes or jewellery. Two: give preference to go out with an a mate. Three: if you are being robbed, do not resist. This page was last edited on 28 August 2015, at 15:43.